If your Kingdom project is stored as an Access database, or you have attached your project to an SQL Server, you can connect your project database to Insight and begin linking items from your Kingdom database. Microsoft SQL Kingdom projects in Auto SQL Server Express (SSE) mode need to be attached before you can link the projects in Insight (see Downloading and Installing SQL Server). 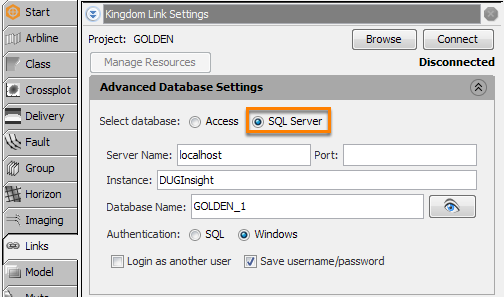 Kingdom does this automatically, thus a project can be left open in Kingdom and then connected to Insight, or manually attached (see Manually Attaching Kingdom SQL Database). To attach a Microsoft SQL Kingdom project, Advanced Database Settings need to be configured in Insight. Open the Links tab from Insight's Control Panel. Click Browse to select your Kingdom database file and click Open. Under the Kingdom Link Settings panel, expand the Advanced Database Settings sub-panel. Click Connect to attach and establish a link to the Kingdom project. Download and Install Microsoft SQL Server Management Studio Express. In the Control Panel, open the Links tab. Expand the Kingdom Link Settings panel. Click Browse to browse to the Kingdom project (.tks file) that you want to connect to. Insight will automatically detect the database type. If the automatic detection fails, you can change the database type in the Advanced Database Settings sub-panel. To configure the SQL Server settings, see Downloading and Installing SQL Server. Once connection is established, the Manage Resources button will be enabled. Click this and the Manage Remote Resources window will be displayed. Alternatively, you can click the Add icon at the relevant tabs and select Add from Kingdom. This will open the Manage Remote Resources window as well. If you have been working on sessions that are linked to Kingdom's Access database, these sessions will work fine and continue to reference to the Access database. However, you can switch to an SQL database. Expand the Kingdom Link Settings panel, click Disconnect to disconnect the link. Expand the Advanced Database Settings sub-panel. At Select database, select SQL Server. Enter the fields similar to the Attaching in Insight. Click Connect to reconnect to the SQL database. Once you have successfully reconnected, you can save the session and Insight will connect to the SQL database in the future. Note: If any of the items imported from the Access database have been deleted in the SQL database, these items will no longer be available. To export an SQL database to Access, see Exporting SQL Database to Access. If there are more than one SQL servers running, enter the port number of the server that has the correct database in the Port field. Expand the SQL Server Network Configuration settings and click the Protocols for DUGINSIGHT link. In the right panel, right click the TCP/IP protocol. Scroll down until the IPALL section (expand this if necessary by clicking the [-] icon). 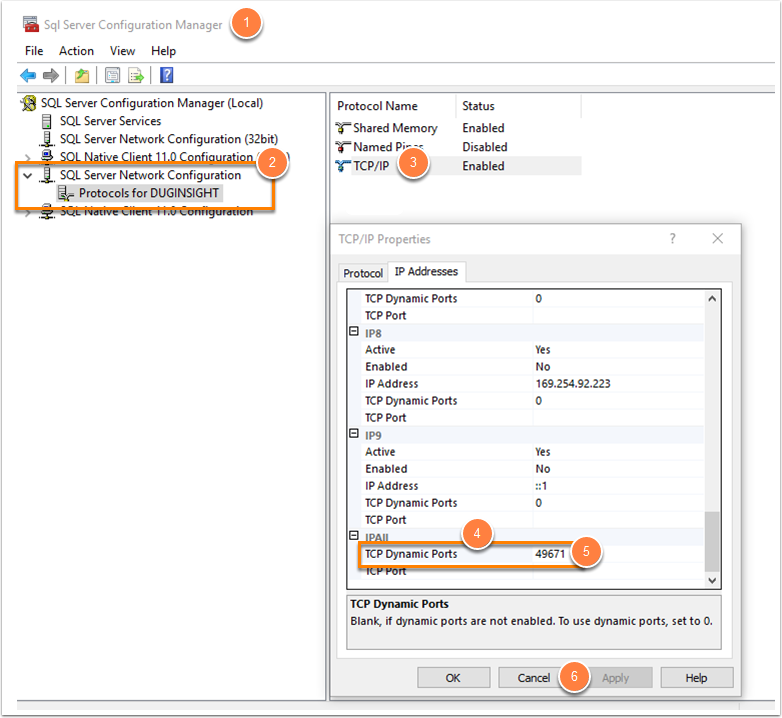 Copy the TCP Dynamic Ports number and add it to the Kingdom Link Settings > Advance Database Settings > SQL Server > Port field. Exit the SQL TCP/IP Properties window by clicking the Cancel button.